Posted on June 1, 2012	by Katy K.
My good friend Dr. M. is on a Quest to get this book better known, specifically to get enough grassroots support behind it that the program it describes can be expanded to the Ann Arbor area. 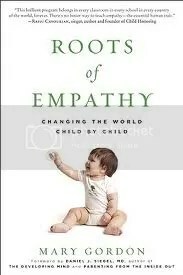 Roots of Empathy by Mary Gordon. The book describes the long-running school program of the same name (http://www.rootsofempathy.org/en/), which Mary Gordon started in Toronto in the mid-nineties, after over a decade of inner city teaching. It is her solution to the problem of how to help those children that come to school clearly never having been taught how to have a real, healthy relationship, and are thus handicapped for learning for the rest of their school career. In the program, trained parent/baby dyads (ok, the parent is the trained one) visit a school program about once a month over the course of a year. A trained instructor comes along, too, and talks to the kids beforehand about baby development and safety. The babies are carefully screened by age – starting at 4 to 6 months old – so that the children will see the great leaps of development that take place during the first year. Because schools must meet standards, there’s also curriculum around it, supporting math and reading standards at several different grade levels. But the amazing thing is how well the program works at creating empathy, and how helpful that skill is in the classroom. Bullying in Roots of Empathy classes decreases to zero or close to it. There’s measurable increase in prosocial/helping behavior, active stopping of bullying in other classes. The kids are able to suggest lots of reasons why a baby might be upset and how to help it. Watching how hard the baby works to meet its milestones makes them more patient and persistent with their own goals, while learning about temperament regarding the baby also gives them understanding about themselves and their classmates. While my account here is filled with dry facts, the book itself is filled with lots of anecdotes of babies gravitating towards the toughest kid in the class and melting the hard outer shell, of foster kids holding the baby and asking if kids who had never been loved could be good parents. There’s also the sad cautionary tales of teen parents who think, for example, that babies are wimps if they cry for their mothers. As Dr. M said, we can train our own children not to be bullies and to stand up for others, but what about the rest of the people they will run into? And as Gordon says, empathy is not taught but caught. Three phrases: enlightening, heartwarming, change the world. This entry was posted in Books, Uncategorized and tagged education, parenting. Bookmark the permalink.